This week in a burst of energy I cleaned my bedroom. I had a little extra time so I went through a jewelry box that I don’t look at very often. At the bottom I found my POW bracelet. For those of you who may be too young to remember, POW bracelets were made following the Vietnam War and given out free to anyone who wanted to make a statement about POW’s whose fate was not known. On each bracelet was the name of a POW along with the date he was last known to be alive. 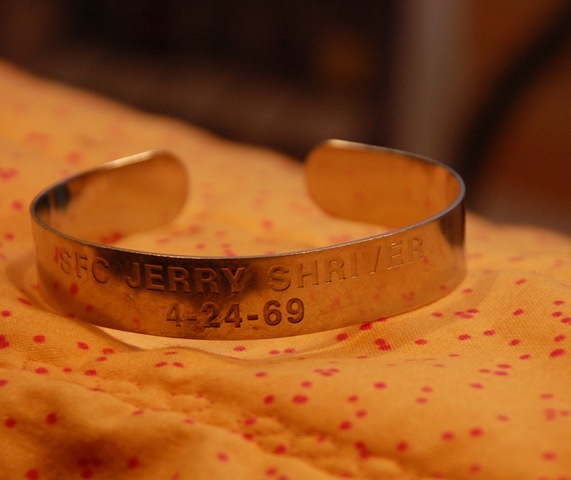 My bracelet, which I started wearing in 1973, bore the name of Jerry Shriver and the date of 4/24/69. I wore the bracelet for about four years. During that time I consulted lists of returned or found POW’s but I never found anything about SFC Shriver. That was of course before the days of the internet. On Tuesday, after I re-discovered my bracelet, I sat down and did some research about Jerry Shriver. Jerry “Mad Dog” Michael Shriver was born in 1941—so he would be 69 years old today. 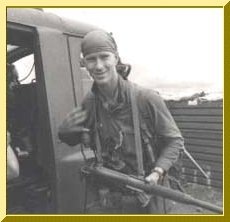 Most of the entries about him say that he was a legendary Green Beret. He was involved in what the army calls ‘insertions’ for “strategic reconnaissance” in enemy territory. According to many of his former colleagues he was fearless and very skilled at being a soldier. His last mission was in Cambodia (then called Laos). Most of the web sites that I found noted this information. However, one site made reference to the Montagnards. This was a term that I was not familiar with so I looked it up on Wiki. Montagnards in Vietnam As it turns out ,the term ‘montagnard’ is French for “people from the mountains” and refers to people who were of various tribal descents and who lived in the Central Highlands of Vietnam. Because the Montagnard felt separate from the Vietnamese majority some 40,000 of them fought along side the American soldiers. But there is something that I learned about Jerry Shriver that I found even more admirable than what he did in action. He was very loyal to the Montagnards who fought with him. Some of the reports say that he was going back to rescue a fallen Montagnard when he was lost. SFC Shriver also diverted a large portion of his army pay to the families of these men. The Vietnam War was a very unpopular war. Many at that time believed that we should not be in the war. When our fighting troops came home, they did not come home to parades and recognitions. They simply came home. And those who survived have continued to live with being largely ignored and unappreciated (and sometimes maligned) in the years that have followed. I hate wars. I believe they are unnatural. However—they are. I have never been asked to step out onto a battlefield and kill someone or risk getting killed and I cannot even imagine the horror of that. But there are many who have done that and have given their lives in the process. And they deserved to be honored for that. Jerry Michael Shriver whose name I wore on my wrist for four years was and is a hero. I remember and honor him. I would like to be notified! Thanks!! Thanks for your comment. I wrote this post 5 years ago and have not re-read it for quite a while. Your comment gave me an excuse to do that. It’s just amazing the courage and integrity that some are able to exhibit in the toughest of situations. Heye buddy, I do a bit of research ,mainly about the 5th Special Forces & MACV/SOG. My father ,who’s name I share, served with Jerry and earned one of his BSMs,in the 5th group. It’s common knowledge the Special Fores and especially the groups in corp II & near the central highlands absolutely treasured the Montagnards they trained . The Montagnads basically trusted ONLY the Green Beret. Ask any SF vet from Veitnam about the Montagnards, and invariably the reply is how we left the “Yards” behind to the fate of the NVA!! Many still try to find and rescue their loyal comrades tby ANY MEANS! A sad state of affairs!! You should read John Plasters two books on MACV-SOG. It’s the unite Shriver was in.